Hillary has broken the 200,000 vote margin with 93% of the Pennsylvania vote in. Obama's Indiana party was slow, there were empty seats. Barack Obama will be speaking shortly from Indiana. I will put highlights here. Barack and Michelle are dressed in black. Mellencamp is playing. Reportedly, Mellencamp has not endorsed Obama and will be playing at an event for both candidates in a few weeks. Obama: Thank you. He smiles. Starts with individual thank yous. Has a list. First one he thanks is Mellencamp and his wife. Polls close in Pennsylvania in 80 minutes. 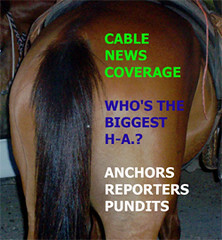 The cable news networks have begun their evening media coverage. We'll have several threads going, but here's one to post your comments about the media coverage of the results. We'll close each thread when comments reach 200.
Who's the biggest Horses As*? Who did you like? What networks are you watching? I'm watching whichever has an anchor talking. As soon as they go to pundits, I change the channel.